Errol: Oh, did I say thank you for all the great comics you people have posted? I’ve read all of them and it is making me realize I should put a bigger effort into promoting these comics, because some of you try to find them! This entry was posted in 2014 and tagged dave, jen, victoria. Bookmark the permalink. 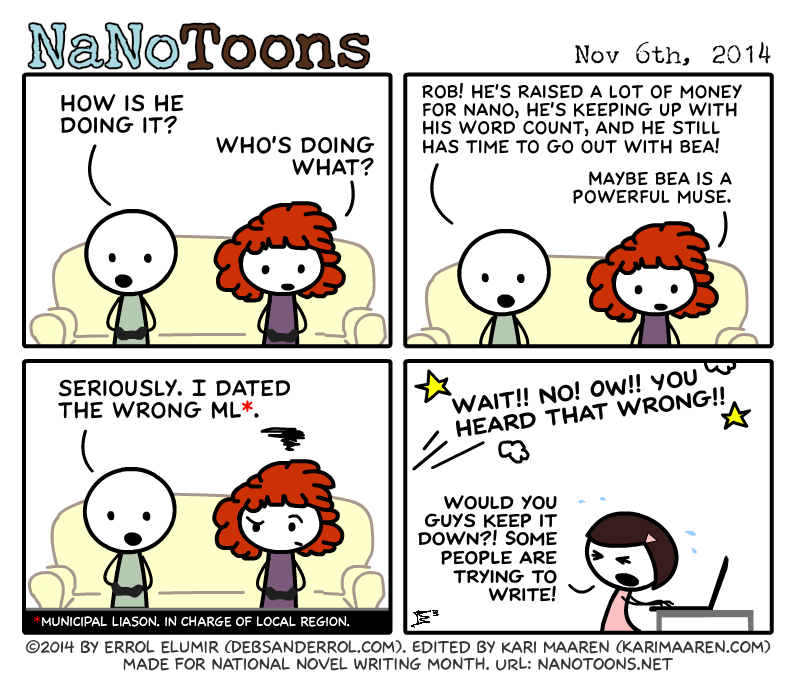 While talking with some others from my region we introduced one of our other locals to both NaNoMusical and NaNoToons. Both are addictive and so very wonderful! I was still deciding whether or not to mention that, when I scrolled down and you had! While I feel a little bad giving her so much do procrastinate on today, how can you not share NaNoMusical and NaNoToons with people? I told a number of people about the musical yesterday. Most of them seem to have ignored me. I’ll just have to keep bringing it up. Could we get the daily toon put back on the site?